River Valley senior Jarret McCarley, seated front and center, will be continuing his basketball career after signing a letter of intent with Glenville State College on Wednesday, May 9, 2018, at RVHS in Bidwell, Ohio. Jarret is joined in front by his parents, Ryan McCarley and Kari Ryan. Standing in back are brother Kaleb Beckner, former RVHS football coach Jerrod Sparling, RVHS Principal T.R. Edwards, and brother Kaden McCutcheon. BIDWELL, Ohio — As was the case during his prep career, the best is still yet to come. 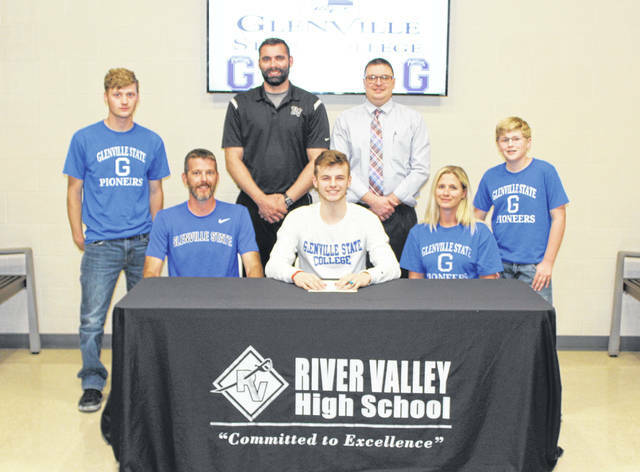 After four years of constant growth with the River Valley boys basketball program, senior Jarret McCarley will keep expanding his game after signing a letter of intent with Glenville State College on Wednesday, May 9, 2018, at RVHS. McCarley — a 6-foot-1 guard — was a three-year letterwinner who also played on the Raiders’ varsity squad as a freshman, but he spent the better part of his first three seasons as a second or third option offensively. 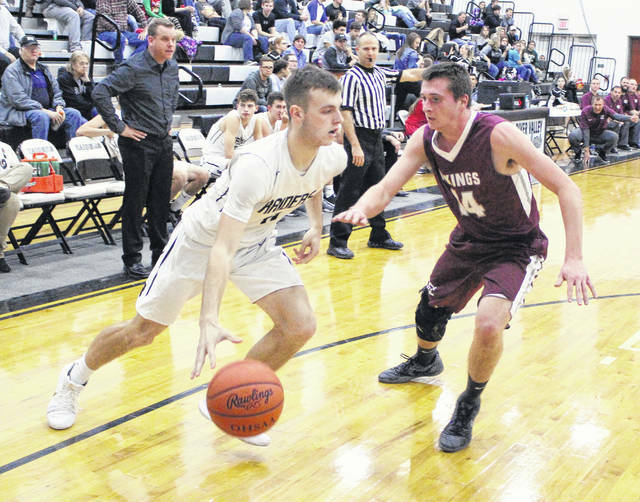 McCarley’s senior campaign, however, ended up being his breakout season after earning All-TVC Ohio and third-team all-district honors with averages of 15.8 points, 6.7 rebounds, 4.3 assists and 1.0 steals per outing. Although the Silver and Black struggled through a 5-18 overall mark, McCarley’s versatility was on full display most every night — rather it be as the team’s leading scorer or banging inside against taller, more-physical players out of necessity. Those characteristics did not go unnoticed, as Glenville State College — a NCAA Division II program that competes in the Mountain East Conference — swooped in and made McCarley an offer that the senior had hoped for over most of his career. Now, with his dream a reality, McCarley is simply looking forward to make the most out of being a member of the Pioneers’ basketball family. McCarley — who also played multiple seasons of football while at RVHS — acknowledged that he needed two years of varsity basketball before he realized that he could possibly extend his basketball career. When that realization came, McCarley says he did everything he possibly could to make that wish come true. Besides the athletics, McCarley noted that the biggest draw to GSC was its academic base in his field of study. McCarley plans on majoring in Elementary Education, and Glenville State is known quite well for its education program. He also felt that the campus — which resides in Glenville, W.Va. — will really help him stay focused on his goals over the next four years. McCarley was never part of a team that finished the season with a winning record, plus the senior endured two different coaches over the course of his four-year prep career. Nonetheless, McCarley made the most of his time in the Silver and Black — and the senior believes that being a Raider has as much to do with him becoming a Pioneer as anything. And for that, he is truly grateful. Jarret currently holds a 3.7 grade-point average and is the son of Ryan McCarley of Vinton (OH) and Kari Ryan of Point Pleasant (WV).